Pictured above: 1987 and 2017 Eagles at the USA Rugby Congress meeting, July 28, 2017. 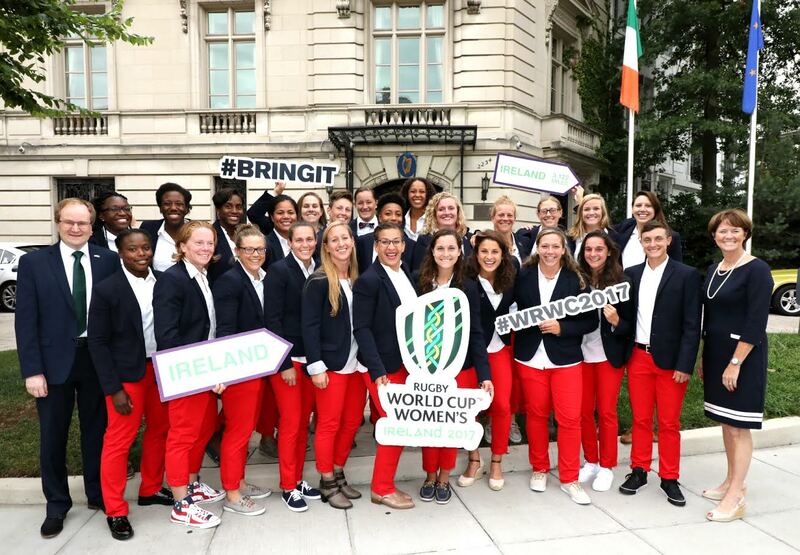 Ruggers and fans from across the country descended on our nation's capital this weekend to send the Eagles off to Ireland for the 2017 Women's Rugby World Cup. The celebration and camaraderie kicked off on Saturday at USA Rugby's Congress meeting. Taking a break from conducting the business of the organization, Congress members bore witness to a momentous presentation recognizing the 1987 Women's Eagles. 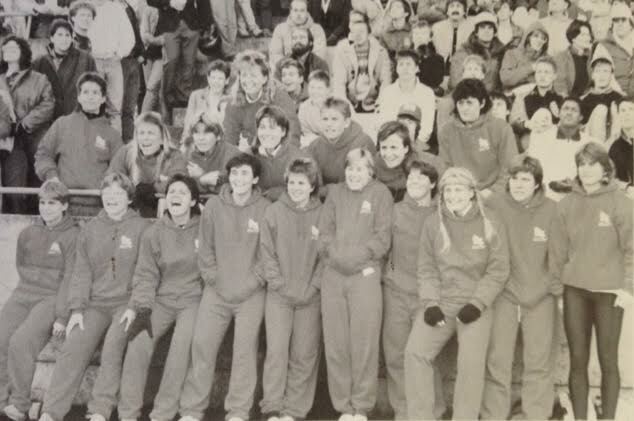 The squad holds a special place in USA Rugby's historical annals as participants in the first U.S. women's international match against Canada - a rivalry still fiercely fought 30 years later through the Can-Am Series. An historic first: The Eagles at the first Can-Am, 1987. USA defeated Canada 22-3. 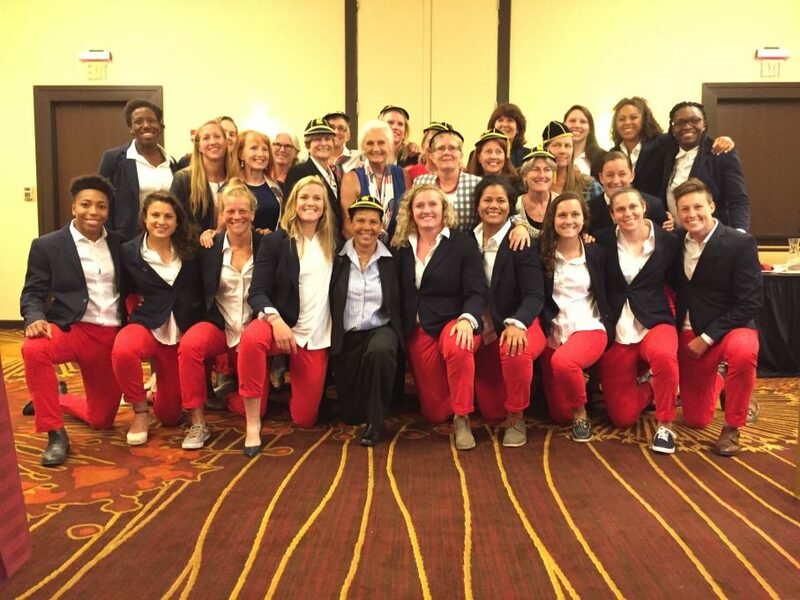 The '87 team and their families were welcomed with enthusiastic applause and cheers by USA Rugby Congress, Board members and staff, and the 2017 Women's Rugby World Cup squad. USA Rugby Chief Executive Officer Dan Payne spoke about the team's accomplishments and hardships, and long-overdue caps were awarded to the individual players who had not yet received one. As Payne called their names, 1987 captain Kathy Flores and 2017 captain Tiffany Faaee capped Lori Rees, Robin Pace, Cynthia Bystrak, Deb Dennis, Tracy Moens and Marjorie (Margie) McClure in turn. Flores also shared her memories of the notable match with those in attendance and expressed the team's well-wishes for the World Cup-bound Eagles. Faaee took to the microphone as well, thanking the 1987 team for paving the way for contemporary female rugby players. After the ceremony, Payne stated, "Our USA Women's Eagles team from 1987 and the acknowledgment ceremony shared with more than 100 attendees on Saturday afternoon gave all in attendance an experience they will never forget. To summarize the magnitude of the event, there weren't many dry eyes in the audience. The '87 cap ceremony and 30-year anniversary of our first women's international - coupled with the amazing induction of the 1991 Women's World Cup winners into the US Rugby Hall of Fame just 30 days prior - is a phenomenal lead in for an upcoming year that includes so many initiatives toward the growth and support of girl's and women's rugby in our country. It was an amazing experience enjoyed by all and I want to thank the 1987 USA Women's Eagles for allowing us to participate in the event." After the recognition ceremony, the 2017 Eagles were honored guests at the Embassy of Ireland. The 2017 World Cup squad was joined by members of the 1987 team and 1991 team - winners of the first women's rugby world championship. Embassy officials welcomed the Eagles warmly, celebrating the team's accomplishments and wishing them luck in their upcoming matches. Speeches were shared by Chairman of the Board Will Chang, USA Rugby CEO Dan Payne, 1987 captain Kathy Flores and 2017 captain Tiffany Faaee, setting an exciting tone for the Eagles' journey across the Atlantic. Luck of the Irish: World Cup-bound Eagles and Embassy officials outside of the Embassy of Ireland in Washington, D.C., July 29, 2017. The following day, USA Rugby's Congress and Board of Directors welcomed the 2017 squad to a breakfast to share their anticipation for the upcoming World Cup. Words of encouragement were shared with the staff and team, reiterating the strong support the Eagles have behind them as they compete on the global stage. Finally, the Eagles concluded the celebratory weekend at USA Rugby Trust's World Cup Send-Off Sunday evening at Scion Silver Spring. Generously hosted by restaurant co-owner and rugby enthusiast Joanne Liu, the special event provided the opportunity for an intimate gathering of rugby fans, players, friends and family. As a special surprise, beloved World Cup alumnae Jillion Potter and Phaidra Knight served as emcees for the event, boasting their Eagles pride and imparting wisdom on the team. Young players from Scion Rugby Academy served as volunteers for the event, relishing the chance to lend a hand while meeting their favorite rugby stars. Attendees each signed a special banner for the squad to take with them to Ireland, and laughter, smiles and stories were shared throughout the night. Proceeds from this event will be used to defray the cost of the team's training, travel, and room and board, and will be contributed toward the Eagles' $150,000 fundraising goal. 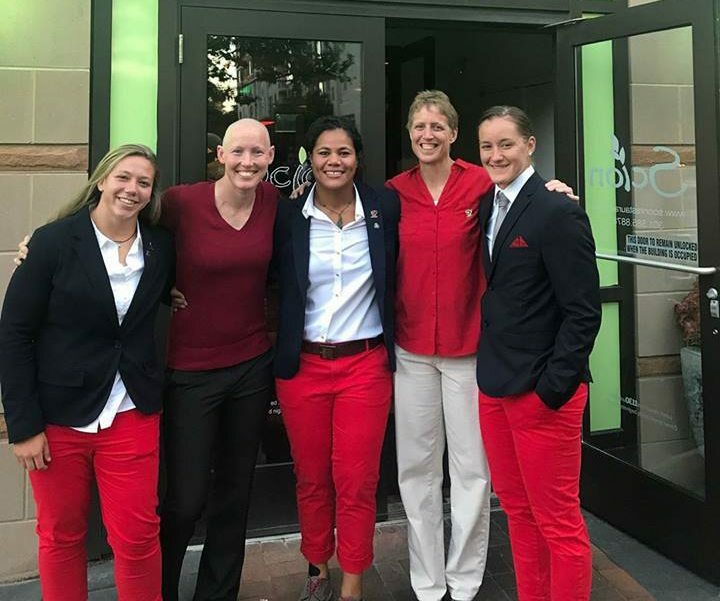 Current and former captains: Hope Rogers, Jillion Potter, Tiffany Faaee, Nancy Fitz and Stacey Bridges at the World Cup Send-Off, July 30, 2017. After a weekend filled with support and excitement, the Eagles took off for Ireland, ready to represent their country on the World Cup pitch. They play their first match in Dublin against Italy on August 9 at 11:30 a.m. ET. There's still time to help the Eagles reach their $150,000 fundraising goal! Click here to learn how you can help the Eagles fly in Ireland.